Retro, vintage, recycle, upcycle, whatever you call it old is always new again and it’s a no-brainer to get some tangible and authentic design ideas from the show that has made a name for its writing, costumes and design. The opening episode of Season 6 of Mad Men reintroduced us to the characters we’ve grown to love and love to hate – and a new face – well hello Bob – I can’t wait to see where this goes! Most lead characters were shown in their various habitats so this, my inaugural post, on Mad Men design & style, is a very rich meal indeed. I’ll point out some essential 1967 design pieces that you can use to mix it up at home. Mad Men Season 6 is set in Winter 1967, after the ‘Summer of Love’ and everything is fracturing. Some people are moving forward at a stellar pace – makes sense if the moon landing is only a couple of years away – while many more a being left behind. So style-wise what we get is a real variety in terms of set design that continues today. Where once in the 50’s there were hard and fast style, taste and most definitely class rules, in the late ’60s its really up to the individual and of course, the size of their budget. Don and Megan are on an all-expense paid holiday in Hawaii while his colleagues freeze in one of the worst blizzards in NYC. It’s an interesting juxtaposition that the episode, so largely about death is also about love and ties. Despite the free love revolution, at this bar it’s the young soldier embarking on the traditional marriage and the older, establishment Don, who’s more into ‘free love’. Note the bar stools – black leather and dark A-line wooden legs. These would be durable but also modern as they mirror the high-rise tower blocks that were mushrooming in New York and around the. Note the 2 skonces at the side of the bar, the use of plants to fill a dark corner and of course the glorious wooden bar itself. Woods featured heavily in the period. There are of course some Hawaiian touches that make me recall the Brady Bunch in Hawaii Tiki doll – right there, stage right. Here again is the use of dark wood in the bed and the furniture. The furniture is carved and elaborate. Note the yellow stripes in the settee and the use of gold in the border. The pelmet and curtains are also very elaborate. That dusty turquoise was still popular from the end of the 50s and early 60s. There’s the clashing patterns of the bedspread, the curtains and other fabrics. This too signifies the rapid change in the era where you couldn’t wait to update a room all at once but quickly, in stages. The neutral carpet is the one thing that brings coherency to the colour and texture in the room. You can’t see it clearly, but the lamp also has a traditional feel. 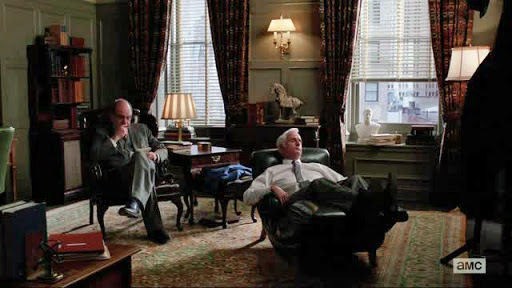 A lot of scenes were set in the characters’ various offices. Makes sense of course, being a show about work, but it also gives a chance to compare the various decor – and boy are they different. 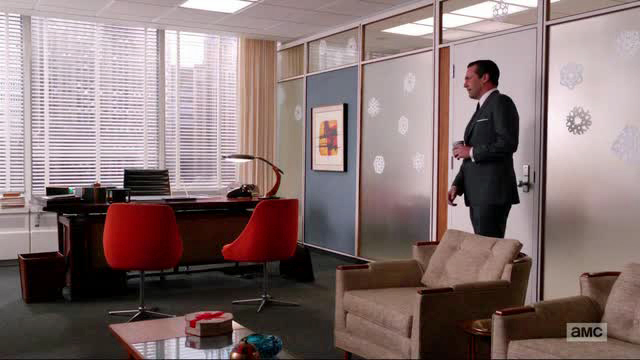 Don’s office is classic mid-century. Warm brown woods, natural fibre, the grey carpet reflected in his suit. The 60’s appears in the orange ‘pop of colour’ chairs. Look at the gorgeous Danish-inspired angles in the table lamp, the bar and the lamp table. Here again we see the dusty blue seen in Hawaii, but much cooler and less frenzied. This room suggest calm and success without being showy. It looks simple, plenty of space and air. Very expensive. Note the hidden pelmets and the warm cream curtains mirroring the natural arm chairs. Roger’s office is much cooler than Don’s in terms of colour palette. In fact it nothing in the office, including Roger has any colour. Note the curtains are a stell grey and the carpet – which had warm tones in Don’s office because of the orange chairs and lounge suite, looks steely grey here. Individually, the pieces are gorgeous and would be showstoppers in any home – when used alone – but as a group, here, particularly in this clinical, space-age white colour palette, nothing stands out and it all looks very stagey. Roger is of course is the oldest key character (not counting Bert) but he likes to feel and be youthful. He is a spoiled boy trapped in a man’s body. His office is colourless but is that because Roger also lacks colour and depth – is he ‘just for show’ like the uber-expensive at the time office peices. Note the use of circles and round shapes. While Don’s office had some curves, for Roger its all curves curves, curves. A lot of this furniture is available for a reasonable price at reproduction houses, Ikea and similar mainstream chains. Look out for the iconic chrome round floor lamp – variations can be found in most people’s houses (even mine and Elena’s ha ha). The black & white pop art can be found in many shops. It’s abstract but ads texture to the room. Note the glass in the bar area making the booze appear to be floating – just like Roger is often floating on booze. Okay, here’s where the real work happens. It’s the copywriters room and its busy and messy and full of paper as you’d expect. There are still some great pieces and use of bold colour. The red and green walls make a great backdrop for the pin board, the cups in plain bold tones and of course the gorgeous chairs in that ubiquitous warm blue that’s popped up in shades all over the place so far. The warm brown wooden filing cabinets are clearly old and they’re meant to be as they are there to do the heavy lifting here – still beautiful clean lines that break up all the white. An entire wall is given to the enormous gold and black peacock abstract print. The colour combo is chic in the late 60’s, 80’s and is making a come back today. Peggy’s boardroom is more conservative than SCDP. However the same black leather bar stools are seen here in chair form. As in the Hawaiian bar, they enhance the gorgeous dark wood surface that they sit below. The familiar sideboard is still good enough for clients in this office, not stuffed into the copy room. The wood panelling is early mid-century and darkens the space. Again, lamps seem to barely get an update though they are often the easiest and cheapest things to change to update a room. Note the art – again abstract and flat. Except for the naive Hawaiian painting in the bar, the other art has been abstract and blocky. Can’t leave Peg’s workplace without mentioning the centrepiece – the amber glass ashtray. I used to collect these types of glass pieces and still love the way colour and light plays through them. A decent one today may be over $100 but well worth the expense for the instant beauty and vintage the piece gives to any room. They feel fantastic to hold as well. If your mum or granny has one, make sure that it somehow ends up with you! Definitely treasure, not trash. The real contrast in the characters’ lives and financial situations can be seen in their homes. It’s Christmas, style-wise a tree clearly hasn’t changed much in 40 years. Brown, brown, brown and well, brown. That’s the hot style of the late 60’s. A sunken living well hello darlings! Look at the various textiles – the couch, the pelmet. The gorgeous wooden lines of the Danish-inspired lounge chair (front, left) and the bar stools. Again, the use of black leather. The wood panelling here, as with Peggy’s office, speaks to the expense. The apartment was $75,000 after all and wood, then as now, is beautiful and expensive. The lamp is orange. The cushions have blue & green covers that again recalls the blue greens in the other rooms. As with the ashtray, the couples drink from amber glassware darlings! Do our mum’s still have those? I loved them. They felt so good and looked a bit mysterious, darkening everything inside. The Francis home also has the must-have tree, but with 3 kids it’s a lot more prominent. The room is overstuffed with furniture and embellishments that are missing in the more sparse, space-age environments popular during the period. None of the furniture patterns match, the colours are all over the place too. It’s clearly not cheap but it’s not classy. Dated more than old. The lamp here, unlike previous rooms is more embellished including the shade. Wood panelling is embellished, the curtain, pelmet and carpet has a flowery rather than abstract pattern as is the art. Random small nick-nacks add to the clutter. 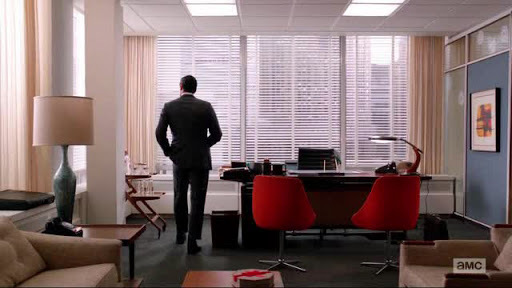 One patch of blue however makes me think the Mad Men design crew just bought a big tin of it and put a wall in every scene. Either way, it’s a nice foil for all the wood and goldy-beige tones. Nothing to see here folks, let’s move along. Peggy also has the blue wall and curtains, but more grey like Roger. She’s got the tree too of course being a good Catholic girl. The white walls speak to her youth and modernity too. The lamps are modern but the embellished dark wood furniture is older and probably bought 2nd hand (no issues there, most of my furniture is 2nd hand too!). She’s a busy girl with no time for being houseproud. Can’t see the floors but they look like lino. Finally the matriarch – the queen of chintzy goldy-beigy! No Christmas tree! too gauche I expect, just a little poinsettia decal on the fireplace. How and why does this room work despite so much detail in every piece from the window dressing to the furniture, the lampshades and the fireplace? It’s the use of a light tone-on-tone. The pale, rich colours not only contrast beautifully with all that black costuming. This is what Betty was trying to achieve in her home – there’s columns, there’s embellishment, there’s carving, there’s pelmets and carpet and wood. But there’s a symmetry too that’s missing in the Francis house and the gorgeous pale rugs demarcate the various areas and add to the colour palette. Note that Roger, the golden boy – loves a room full of silver, where as mama loves her gold! They both love clear glass although mum, being in her 90’s was one for the cut crystal variety. Lots of small pieces here too but the use of similar textures and colours and also plenty of space makes the area feel expensive rather than cluttered. 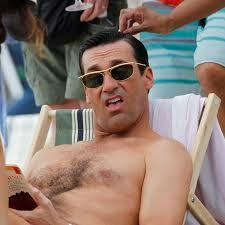 Finally, the Mad Men crew get to use up all their blue/green paint! Still there are some lovely touches of retro products from the kettle & toaster to the wall plate. The corrugated splashback is also interesting and could work in a modern, less-cluttered kitchen. I also like the plants on the high shelf, it’s not something seen much today but leaves you both light and space to move around. Note the traditional spice rack on the wall near the fridge. Overall this kitchen is clearly dated and the green makes it look almost mouldy but it also looks homey and a nice place to do your homework on that marvellous big kitchen table. By contrast, the Draper kitchen is moving towards the open plan we like today. The table is replaced by the bar that’s situated in the living room. We can’t see much here but we do get a closer look at the bar stools and note, while the cabinetry is wood, the bench top is a light colour. Used sparsely, as a feature piece or island, this could work in a modern kitchen too. Paneling? Check. Dark, ornate wood furniture? Check. Expensive rug in flowery design, traditional lamp? Check, check. Freud himself couldn’t have styled it better. The chair that Roger is sitting in however is the modern black leather & dark wood that we’ve seen throughout.